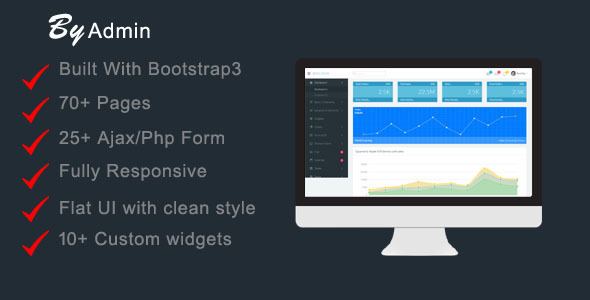 Byadmin is the excellent responsive and multipurpose Admin Theme powered with Twitter Bootstrap 3.0 Framework. Byadmin can be used for any type of web applications dashboard: custom admin panels, admin dashboards, CMS, CRM, SAAS and websites: CMSs, SAAS, CRM, HRMS, Support & Social portal, e-commerce, personal business, corporate. Byadmin has a minimal, sleek, clean and intuitive design which makes your next project look awesome and yet user friendly. Byadmin is minimal, sleek, clean and lightweight which makes your next project look awesome and yet user friendly. Byadmin has a huge collection of UI Elements, jQuery plugins and works seamlessly on all major web browsers, tablets and phones. User friendly, intuitive, and fun to use, Have look Byadmin today!